Wyse WY-50/WY-60 Terminal Emulation • ZOC: Modern Wyse terminal emulator for Windows and macOS. 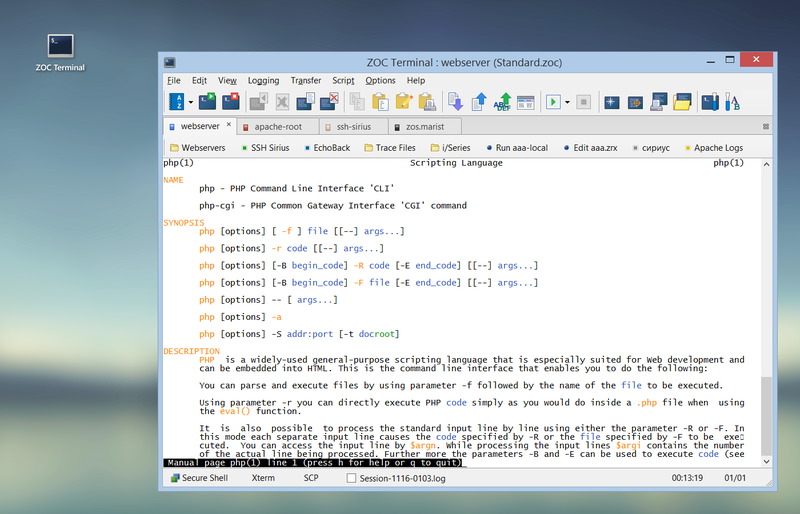 ZOC Terminal is a professional Wyse terminal emulator, offering solid implementations of the Wyse-30 (WY-30), Wyse-50 (WY-50) and Wyse-60 (WY-60) emulations, which let you access servers via normal telnet or secure SSL/SSH connections. Overview: Wyse is a terminal emulation standard used by the Video Terminal Line character terminals introduced in the 1980s by Wyse to access cloud and mainframe systems. Mainframes are large servers which are mainly used by businesses for large scale data processing. Mainframes can be used by thousands of users at the same time, but they need to be accessed through so-called dumb terminals or thin clients. Wyse hardware terminals are often used for this purpose, but by using terminal emulation software you can actually access server from a regular computer running Windows or macOS. Wyse Technology was founded in 1981. The company became famous in the 1980s as a manufacturer of character terminals. Most of these terminals can emulate several other terminal types in addition to their native escape sequences. These terminals were often used with library card catalogs such as Dynix. In 1983, Wyse began to ship a device called WY-50, a terminal that was priced some 44 percent lower than its nearest competitor. Following the WY-50 was the WY-60, which became the best-selling general purpose terminal of all time. In addition to standard character-mode operation, the WY-60 supported box graphics that allowed the server/software to to produce more attractive displays. A key feature of the Wyse range of terminals was the ability to adopt numerous "personalities" of other terminals in addition to their own native modes. In this way the Wyse terminal itself became a terminal emulator because it was able to simulate (emulate) physical terminals from other manufacturers, e.g. Televideo 925/950, DEC VT52 and DEC VT100 and IBM3301. Wyse terminals soon became the terminal of choice for the reseller community largely due to the resellers' ability to buy terminals from the one supplier and offer them to the users for the majority of other host systems. Terminal emulation became a way to escape the bonding that manufacturers tried to create between buying their servers and the need to buy their terminals. However as personal computers and networking became more wide spread, software terminal emulation programs began to appear which included the ability to emulate Wyse terminals as well. Thus the Wyse terminals that became successful by emulating other terminals, suffered the same fate from other emulators (this time PC software makers making software that emualated what Wyse hardware terminals did). In late 1995 Wyse would again changed direction and moved into the market sector for which they are still known today. Wyse released something called a "thin client" which is halfway between hardware terminal and software. When combined with a standard monitor, keyboard and mouse, it is designed to provide the lightweight front end to applications based on a central server. However, today most 'terminals' are simply a software running on a PC. But many standard Linux/Unix oriented telnet clients can't be used to emulate Wyse terminals, because today Wyse is a rather arcane and somewhat outdated standard, that isn't as popular anymore as it used to be. ZOC however supports a series of Wyse emulations and lets you access servers via a telnet or SSL/SSH connection using the Wyse WY-50/WY-60 and Televideo emulations, but ZOC also supports a wide scale of emulations used in the Unix world, some of which Wyse originally emulated, like Xterm/Linux, VT220, QNX, TN3270, TN5250, Wyse and others. The ZOC telnet/SSH client also includes a number of other useful features. It is highly configurable and includes the usual terminal features such as keyboard redefinition and scroll back buffer. It also has some very advanced and unique features such as a powerful script language and automatic triggering of actions based on received or typed text. This terminal emulation software also supports VT102, VT220 and several types of ansi as well as Wyse, TVI, and Sun's CDE. ZOC also features major file transfer protocols like X-, Y- and Zmodem as well as Kermit and others. All these are offered in solid implementations that leave nothing to be desired.